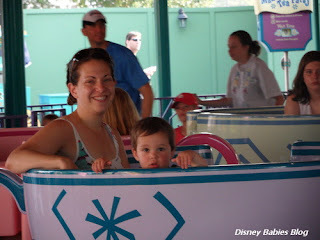 Disney Babies Blog: Wordless Wednesday Hop! Noah spotted his daddy, refusing to ride the Tea Cups! Awww how cute! !He's adorable and what a perfect WW pic. The look says it all!!!! I have a similar pic of me and Roseanna. SOOOOOO adorable! My hubby refuses to ride this ride! That photo is cute!! This is truly a magical moment. Just adorable! What a cutie! Cute picture! I love riding the teacups! The look on his face says it all... LOL! Teacup for two. Too sweet! Thanks for hopping aboard the Wordless Wednesay blog hop! Very cute:). p.s.. I don't do teacups either! Oh, so adorable. I loved the teacups when i was a kid. This pic exemplifies Disney memories in the making! So very cute, I love the Tea cups..